if you would like any of the panels below, just let me know which one, and why. each fabric panel is a one off. they feature original hand drawn graphics printed by hand. 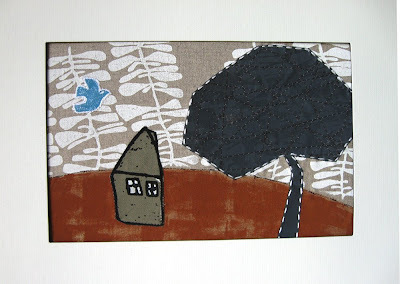 the little bird is a lino cut print - no panel really feels complete without one. familiar techniques like applique, hand embroidery, machine stitching and surface marks add texture to the flat surface of the panels which are 100% cotton or cotton/linen blend fabrics. i use non-toxic, eco-friendly inks that are intense and durable. the panels are securely mounted onto foam core and matted. all you need to do is buy a frame. at the end of august i will choose an answer i like. then your panel will be sealed in a cellophane sleeve and posted to you in a sturdy cardboard mailer. more of my panels can be found at UDESSI, a beautiful online gallery featuring original australian art and design. and if it's cushions you're after, i have a bunch of new ones in my shops, here and here. thanks for stopping by to my very infrequent blog. #1- that's the prettiest patterned sheep ever! All this work is made with fabric, or is it a print? i love the texture and the look! The colors of number 3 are wonderful, I'm loving mustard browns at the moment and it goes so well with the green and chocolate. 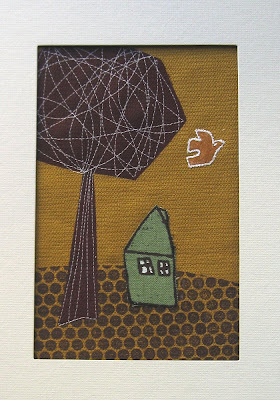 The free stitching pattern of the trees is lovely and strong. these are all made with fabric. all one offs. Hello, #1 is the pick of the panels for me. My 81yo neighbour and supplier of many organic avocados to our family is about to say goodbye to his beloved old sheep named Berice. I'd love to frame this for him as a memoir. I love number one. 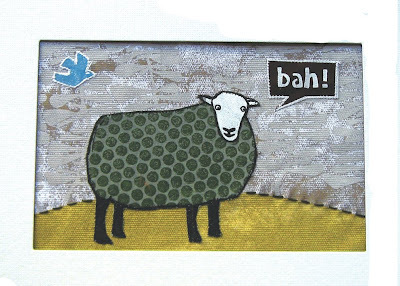 (of course I am a little biased as sheep are a favourite of mine!) I like the contrast between the different textures and colours. 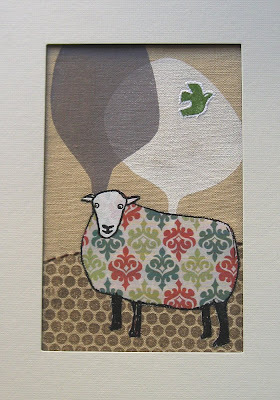 I love the sheep panels because the sheep look like they have clever thoughts. You crafty crafty lass! I have just stumbled on your bah-rilliant cushions on that money trap commonly known as Etsy. As my credit card groans with fear I am eenie meanie miney moeing between city and sheep or perhaps more fittingly as I live in Canberra it should be sheep in the city - it's the bush capital afterall. Oops, I am rambling. So I moseyed on over to your blog and what great timing!! A give away!!! I can't pick a favourite, don't make me, I like them all. Kudos on your creativity! 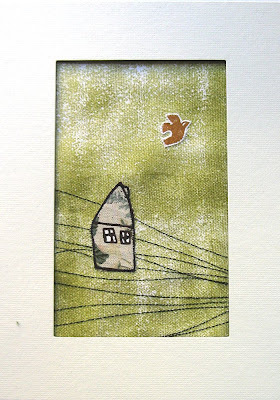 For its blue bird and its little house and its red dirt and its seaweed sky but mostly for its cut-out ghostly tree, it's number 5 that catches my eye the most.